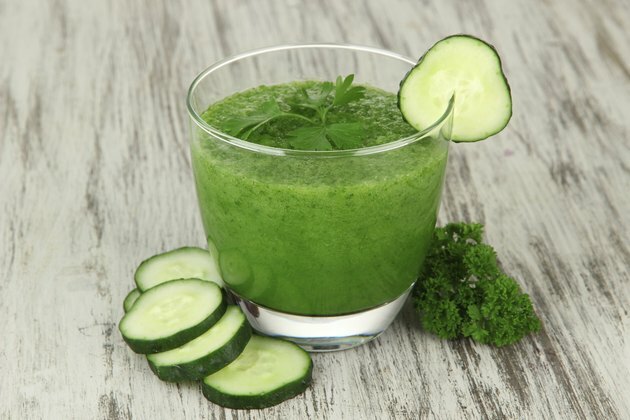 Are There Benefits to Using Cucumber Juice on Facial Skin? Among egg white masks and brown-sugar scrubs, the cucumber takes its time-tested place among natural home remedies for facial skin care. In addition to plenty of word-of-mouth recommendations and anecdotal tips, hard facts support this veggie's place in the skin care pantheon -- you need only take a look at the chemical composition of cucumbers to understand exactly what types of benefits the cucumber offers in terms of all-natural skin care. In an article for Sharecare.com, “Feed Your Skin, Starve Your Wrinkles” author Allison Tannis breaks down the most basic skin-friendly components of cucumbers. In addition to its hydrating water content, which lends the skin moisture and reduces puffiness, the vegetable packs vitamin C and caffeic acid, both of which soothe inflamed or irritated skin. If you juice your cukes with the skin on, silica from the peel helps firm up sagging skin. Melissa Breyer, co-author of National Geographic's “True Food,” notes that because cucumbers have the same pH as skin, they help maintain the its protective acid mantle -- the thin acidic film on your skin that wards off impurities. In 2013, a study published in “Fitoterapia,” a journal dedicated to medicinal plant research, took a closer look at the bioactive compounds that make cucumber juice beneficial for skin care. The report identifies a variety of compounds that make cucumber juice “nourishing” for the skin. The authors conclude that these elements lend cucumber juice a skin-soothing effect that eases irritation, reduces swelling and even alleviates sunburns. Cucumber also offers antioxidants, which combat skin-damaging free radicals. While pure cucumber juice makes for a cooling face wash, you can also reap cucumber's benefits by eating the veggie or drinking cucumber water, made by filling a pitcher with cold, distilled water and letting the slices of a whole cucumber soak in the water for at least 45 minutes. In either case, the skin of your face and body benefits from the cucumber's vitamin C, which bolsters your body's collagen and elastin production and its connective-tissue-bolstering silica. Additionally, cucumber packs plenty of fiber, magnesium and potassium, which help regulate blood pressure. This in turn reduces puffiness and soothes inflamed skin, both symptoms of high blood pressure. Face washes and ingestion aren't the only way to benefit from cucumbers. The age-old trick of placing cooled cucumber slices over your eyes hydrates the skin and contracts blood vessels to reduce swelling and puffiness. You can also toss a whole sliced cucumber into your bath to soothe the skin or puree and chill fresh cucumber to use as a tightening toner. Mixed with ingredients such as avocados, egg whites, milk and essential oils, pureed cucumber also lends itself to gentle, skin-soothing face masks. Can You Get Rid of Dark Circles Under the Eyes With a Cucumber?